Thanks to a last minute comment in front of Mayor Lauren Meister two weeks ago, traffic won’t be streaming up and down WeHo’s Havenhurst Drive from the massive development at 8150 Sunset Blvd. That comment came at the end of a meeting at which the Los Angeles City Council’s Planning and Land Use Management Committee approved the project, as did the full City Council nine days later. Meister attended the meeting with Stephanie deWolfe, the city’s Community Development director, and attorney Beth Collins-Burgard, and negotiated some changes in the size of the project, which largely sits on the northern border of West Hollywood. It was only after those changes were accepted by Townscape Partners, developer of the project, that Meister learned that one of its driveways was within the boundary of West Hollywood and opened onto Havenhurst, a residential street. One of Townscape’s attorney’s asked if the developer would have any problems getting permission for curb cuts, which alerted Meister to the fact that the driveway is within the WeHo city limits. The project has been controversial for its likely impact on West Hollywood, with residents and City Hall expressing concern about its height, the traffic spillover into West Hollywood and its impact on WeHo’s sewer system. 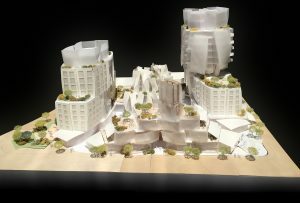 But the project generally was understood to be totally within the boundaries of the City of Los Angeles and outside West Hollywood’s city limits. Meister and the city team worked out a handshake agreement with Townscape in the minutes before the Land Use committee heard the 8150 project. Under the terms of that deal, the height of development’s tallest building, once proposed for 234 feet, will be reduced to 178 feet as measured from the lowest point on the sloping site. The top floor of that building will have a 10-foot setback on its southern side facing West Hollywood so that the building will appear less tall, and mechanical equipment such as air conditioning compressors will be moved away from the WeHo border. Also, Townscape agreed to spend $2 million on traffic improvements and to fund construction of a cul-de-sac on Havenhurst to prevent traffic from streaming up and down that residential street. But, given that the 8150 Sunset project’s driveway would enter Havenhurst inside the WeHo city limits, what if that cul-de-sac were installed north of the driveway? The West Hollywood City Council held an emergency session on Saturday to discuss the issue. It agreed to demand that Townscape’s driveway be north of the cul-de-sac. The council’s final decision to drop its opposition to the project came in a 3-to-2 vote, with Meister and Councilmember John D’Amico voting no. Supporting the project were council members John Duran, John Heilman and Lindsey Horvath. Duran and Heilman have been beneficiaries of campaign donations from Townscape Partners and its owners. Townscape also is the developer of the controversial 8899 Beverly Blvd. project in West Hollywood, which won the WeHo City Council’s approval in August 2015 in a vote divided exactly as was the 8150 Sunset Blvd. vote. THIS IS THE FIRST TIME EVER I’VE SEEN OR HEARD A CITY COUNCIL MEMBER “APPEARING AND ACTING OUT TO PROTECT OVERDEVELOPMENT. I THOUGHT YOU WERE THE ONE “GOOD GUY ELECTED TO DO EXACTLY THIS … BUT FOR US, OUR CITY, THE DEVELOPERS YOU USED TO BE HARSH WITH IN ATTITUDE. 1. The Project Property itself is not in the City of West Hollywood. It is a property IN THE CITY OF LOS ANGELES. 2. The Los Angeles City Council HAD ALL POWER AND RESPONSIBILITY OVER THIS PROJECT. 3. IT IS “SAFE” FOR MS. MEISTER TO BE A PHYSICAL ON THE SCENE THROWBACK TO THE 60’S PROTESTERS. It is NEXT to the City of WeHo but The Council, The Plannng Commission (ha! an “advusiry board who can only recommend to City Council who can do what they suggest, or not). SO Puff-Meister got some actual ‘street cred’ by anyone believing she was fighting against weho overdevelopment. Nobody cares in LA City about what wrho thinks or feels about L.A CITY PROPERTY. gotta run, just finishing up a re-binge of Game of Thrones. “Shame!” evil nun is about to get Cercire’s tevenge. “Me no-likie” what really has been going on with this highly dragged out, and reported “diligently” by wehoville … while the actual huge projects IN weho, get crammed into a bland “article” preventing a cohesive discussion about the 3 major projects IN WEHO and Ms. Meister has been mute along with allvthe city council members. I’m not sure I understand what just happened here. It was my understanding that two weeks ago, Mayor Meister and CDD Director Wolfe attended the meeting and negotiated this agreement with Townscape. It had been reported that the City, based on the agreement negotiated between Mayor Meister and Townscape, had removed their opposition to the project. It was reported that the agreement at the time included a barricade on Havenhurst to prevent cars coming southbound from Sunset. Was the barricade/cul-de-sac installation (and other concessions of Townscape) contingent upon the City of WeHo moving from “oppose” to “support”? If that is the case, why did our chief negotiator (in this case Mayor Meister) who shook hands on the agreement, vote against the agreement she just negotiated? If the barricade/cu-de-sac installation (and the other concessions of Townscape) were agreed to with Townscape in exchange for the City of WeHo removing their “opposition” to the project, and since that time, the concessions have been incorporated into the project and received City of LA Planning and Council approval, then why would the City of WeHo move to “support” the project? Thank you Lauren for sticking up for us! Good for you Lauren. People warn about new buildings, mixed use, hotels etc that will increase or further further congest the street traffics (major or minor, residential or business), and they are often ignored in favor of whatever density goal the City Council has in mind. At last someone speaks out.